When Ron Paul released a statement earlier this week informing supporters that “moving forward … we will no longer spend resources campaigning in primary states that have not yet voted,” it was easy to imagine Mitt Romney’s campaign staff quietly rejoicing. The Congressman’s staff was quick to clarify that he was not officially suspending his efforts for the nomination, but it was hard to see this as anything other than the end of the Paul campaign—and, in turn, the beginning of Romney’s cooptation of it. As Barack Obama’s campaign proved in 2008 after its bruising primary fight against Hillary Clinton, a party that’s been unified in time for the national convention is its own reward. But bringing Paul’s supporters into the fold would also seem to have a special attraction for the Romney campaign: The Massachusetts governor earned plenty of votes in the primary, but he never quite inspired the enthusiasm of the Paul movement, which has regularly attracted thousands of committed supporters to rallies. It’s only reasonable for Romney to hope he can transfer some of that fervor—especially from young people, a demographic President Obama himself seems to be targeting—to his own campaign. Having spoken with a wide swathe of young Paul voters, however, I’ve learned that’s an exceedingly unlikely proposition. Paul may have been running for the Republican nomination, but what he produced was a movement whose identity revolves around his own personality and his professed libertarian ideology. It’s a movement with hardly any affinity for the GOP—and for a man like Romney least of all. It’s telling that Paul supporters almost uniformly refer to Paul’s bid for the presidency as a “movement” or “revolution,” rather than a “campaign.” To ask about their allegiance to the party is, for many of them, to make a category mistake. “It’s not a matter of partisan politics,” says Casey Given, an organizer for the University of California Berkeley chapter of the Youth for Ron Paul group. “It’s more about the ideas than the party.” Indeed, a common refrain among Ron Paul supporters is that the Republican Party needs to be rebuilt from the ground up. Generally, Paul’s supporters speak of his campaign as something more akin to a political science or philosophy seminar, than a campaign for public office. Paul’s message has always encouraged his supporters to believe there’s much more at stake than temporary occupancy of the Oval Office. 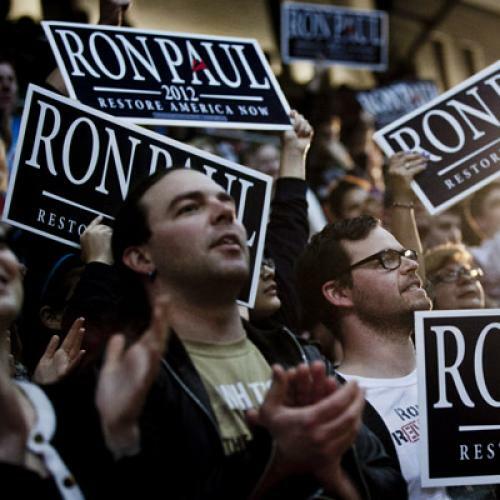 “It’s not designed to win votes, it’s designed to illuminate the right path forward for both the U.S. and its role in the world and how we manage the economy,” says Jacob Arluck, an organizer for Cornell University’s Youth for Ron Paul chapter. Needless to say, Barack Obama faced nothing like these challenges when he wooed disaffected Hillary supporters in 2008. Paul’s fans, it seems, will insist on continuing to divide the GOP, unless, and until, they can take it over entirely. Eric Wen is an intern at The New Republic.